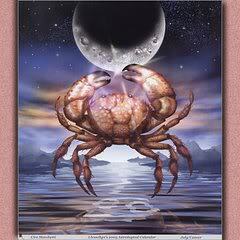 The Cancer New Moon occurs on Friday, June 27th, at 1:08 am MST at 5 degrees Cancer 37 minutes. Here’s the New Moon chart: CancerNewMoon2014. The first water sign of the zodiac, Cancer is extremely sensitive emotionally. Not surprising then is the fact that this sign’s symbol, the Crab, carries its ‘home’ – a protective outer shell – with it wherever it goes in order to keep it safe from harm. Accordingly, for Cancer natives, their home also provides the ultimate refuge and is of the utmost importance to them as a place of safety, security and comfort. Cancer also rules our family of origin and the conditioning influences we’re raised with throughout our early upbringing and childhood. Our ego-centric identity is primarily shaped by our family. Their influence and conditioning tell us who we are and contribute either to the development of a healthy self-image or one that’s damaged resulting in low self-esteem and emotional insecurities that are often carried into adult life. The evolutionary intention of this extremely sensitive sign is to develop INNER EMOTIONAL SECURITY. Through Cancer, we become aware of all of our outer dependencies on people, places and things that we think will provide for our happiness and well-being. As we suffer disappointments and let-downs from these outer sources, we learn that the only true source of emotional well-being is ourselves. Real emotional security can only come from within. Jupiter has been traveling through Cancer for over a year now and is finally finishing up its role in the Grand Cardinal Cross it’s been a part of for the last eight months along with Uranus in Aries, Mars in Libra and Pluto in Capricorn. It also continues to be part of an ongoing Grand Water Trine with Saturn in Scorpio and Chiron in Pisces. Increased emotionality and insecurity has resulted from the tremendous social, cultural, political and economic upheavals and changes associated with these extraordinary celestial patterns. Evolution has required that we face personal fears as we deal with all the unexpected and irrevocable but necessary changes. The ongoing Grand Cardinal Cross is further activated by the Sun all next week. The Sun will oppose retrograde Pluto in Capricorn on the 4th (watch for power struggles), square Uranus in Aries on the 8th (embrace change and break free), and square Mars in Libra on the 19th (compromise or stand-offs). And as Mars finally finishes its post retrograde trek through Libra, it too will once again ignite this Cross. So expect more changes that will probably increase insecurities! The way to successfully navigate all these changes is to FEEL your way through. FEEL your emotions! Don’t deny, ignore or suppress them as our culture often teaches us to do. Acting on your emotions is optional; feeling them is not. Seek also to understand their origins as this will help you to effectively transcend their ability to emotionally ‘trigger’ you again in the future. And finally, matters of freedom and responsibility will take center stage later in July as retrograde Saturn in Scorpio stations direct on the 20th reflecting new realities especially concerning money, power, responsibility and authority. It’s time for greater accountability by everyone! Uranus in Aries stations retrograde July 21st for five months. Achieving and maintaining a healthy self-image requires us to be true to ourselves. Often, being true to our self requires that we break free of expectations to conform to other people’s opinions, beliefs and values – especially our family! BE who you really truly are. For there’s really no better way to really truly ensure your INNER emotional security and well-being! The Leo New Moon is on July 26th at 3:42 pm MST! Copyright 2014 Donna Lee Steele All rights reserved. This entry was posted in Planetary Events and tagged Cancer, ego-centric identity, family, feelings, Grand Cardinal Cross, Grand Water Trine, home, inner emotional security, Jupiter, Mars, Nodes of the Moon, Pluto, protection, safety, self-image, Uranus. Bookmark the permalink. I dreamt that I was shown four doors. I was told that I could choose one. As I pondered which one to choose I was told that any one I chose would be the correct one! How powerful is that?! This particular chart has all sorts of goodies in it … I love it! Powerful stuff…this new moon. No wonder I awoke with an image of what attachment and connection really look like. Thank you!